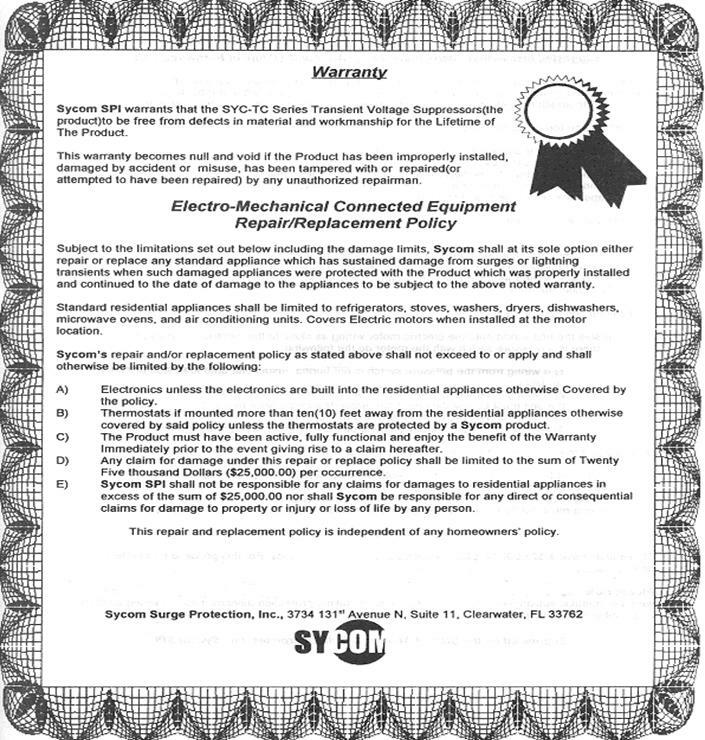 Whole House Manufacturer’s Surge protector warranty—Note: Lightning Rod Parts, LLC is an authorized distributor of this product., however, any warranty claims must be made directly from/with the manufacturer. 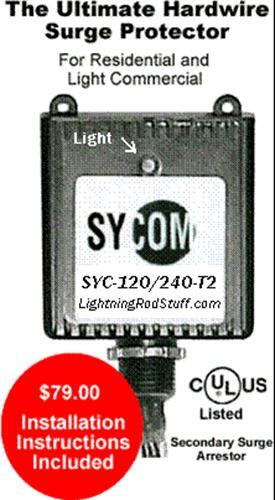 SYCOM’s SYC-120/240-T2 Commercial and Residential Surge Protector is designed for whole house protection on any hardwire application. 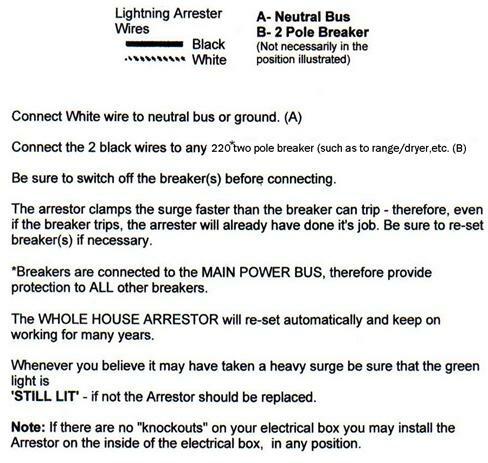 Installation: Hardwire in parallel onto any two pole breaker such as a breaker for Electric Range/Dryer/AC, etc. Thermal Fusing with automatic reset. Enclosure 2-7/8” x 3” x 1-3/8” - Shipping Weight 2 lb. CATV Converters and Decoders—TV Sets—VCR—Satellite Receivers—Projection TV’s—FM Receivers—Home Entertainment Centers—Video Camera’s and Monitors—Computer Local area Networks. 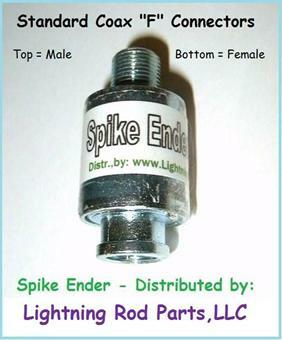 Spike-Ender provides the most economical and easy way to install surge voltage protection available. Surge protection attack time: 0.0000001 seconds. Maximum Surge Current: 5000 Amps. Maximum surge voltage: Multiply 5000 times ohms of coax loop. Surge Life; - 200 surges of 500 amps. Normal Resistance across coax: - 10,000 Meg ohms. Surge Resistance: - Approx. 0 Ohms. Power Gassing capability: - 50 Volts DC or AC peak-to-peak. 36 volts RMS 10 Amps. Connectors: - One F male—One F female. Dimensions: 1-385 x 0.815 dia. Multi-Use & Telephone Line Surge Protection # PHN $ 39.00 — Protects up to two phone lines and/or most low voltage circuits. Key Pads, alarms, gate openers, thermostats, etc. > At the outside telephone box, install the suppressor inside the box or let it hang by the wires outside the box in a wet proof location. 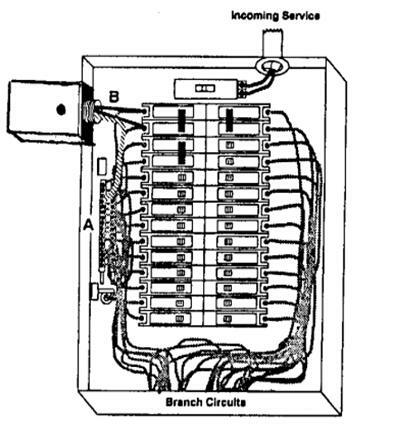 > Connect the large green wire to the telephone ground terminal or any good ground. Sometimes the electrical ground is nearby and you can connect to it. > Each telephone line has two wires, they will be either Red and Green and/or Black and yellow. > There are 4 small wires on the suppressor. One pair for one phone line and the other to the second line (if you have one). > There is no polarity to the suppressor wires. You can connect any of the suppressor wires to the phone lines in any order. > Keep the wire as short as possible and avoid sharp bends and kinks in the suppressor wires.